Fifth. 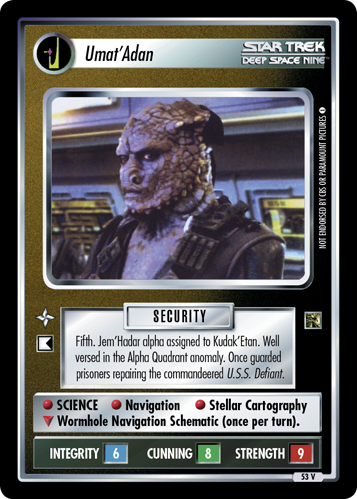 Jem'Hadar alpha assigned to Kudak'Etan. Well versed in the Alpha Quadrant anomaly. Once guarded prisoners repairing the commandeered U.S.S. Defiant. • SCIENCE • Navigation • Stellar Cartography ∇ Wormhole Navigation Schematic (once per turn). Image Source: Deep Space Nine: "One Little Ship"